It happens every time I walk by the “new books” section of the library…I grab every book that catches my eye, even though I have about thirty books at home waiting to be read. I just can’t help myself! That is exactly what happened when I walked past Frazzled for the first time. The cover just sucked me in, and when I flipped through the pages, I knew that I both needed to read it, and pick up a copy at the bookstore for my classroom. Trust me, you’ll feel the same. I thought this book was spot-on to what middle grade readers would like and can relate to, with the combination of words and illustrations making it fun and enjoyable to read. While at the ALA conference, I was able to get an advance copy of the next book in the Frazzled series, coming out September 26th. It didn’t disappoint! Enjoy our interview with the talented author and illustrator of Frazzled: Everyday Disasters and Impending Doom, and Frazzled: Ordinary Mishaps and Inevitable Catastrophes, Booki Vivat! What three words would you use to describe your books? Funny – Abbie is a very expressive, dramatic character. That combined with all the complications of middle school life makes for some pretty hilarious moments. Plus, it’s full of lots of entertaining doodles that help get readers into Abbie’s head! Honest – Writing Frazzled was a very personal experience for me. I wanted to capture the middle school experience as honestly as I could. Because of this, many aspects of Abbie’s story are rooted in my own experiences at that age. Even though Abbie is a fictional character, so much of her personality and feelings are influenced by who I was when I was younger and the memories I have from middle school! Empowering – Abbie goes into middle school feeling overwhelmed and underprepared. At first, she really just wants to survive, but what she learns is that even in her angst and uncertainty, she has power and a voice and the ability to change the world around her. I hope readers will read this book and feel empowered in whatever they’re dealing with in their own lives! When writing a hybrid book like this, what is the process to figuring out what the pages will look like? My process for each page is a little different—and that’s actually what makes it so exciting and fun to write! When I first started the Frazzled series, I’d never written an illustrated novel like this before, so I spent a lot of time trying to figure out my writing process. It wasn’t until I began writing and drawing simultaneously that the whole process began to flow naturally. Sometimes I’d write a scene and figure out what I wanted to draw later, other times I had an image in my head and would write around that. Frazzled is heavily illustrated, but it’s much less structured than a comic or graphic novel. The layout and structure varies from page to page, so my creative process is constantly adapting and evolving as I tell the story. Being in the publishing world, you’ve been around books quite a lot! What inspired you to take your doodles and turn them into something more? The idea for Frazzled actually came from a pretty dramatic drawing of me that said “I live my life in a constant state of impending doom.” It made me think about when I first started feeling that way, and I realized it all went back to middle school. I knew that there were a lot of stories about the middle school experience, but growing up, I never really saw many characters who looked like me. I think, to some extent, that lack of representation and visibility was always at the back of my mind, so when it came to telling this story, it felt like Abbie Wu was the right character to help me do it. Through Abbie, I was inspired to not just explore those frazzled middle school feelings, but to write my younger self into a literary landscape where I hadn’t really existed before. Is it cheating to say that I would still want to do something with books and kids? I can’t imagine doing anything else! I’d actually love to be a children’s librarian. A good librarian can make such a huge difference for young readers. Growing up, I was really lucky to know some amazing librarians. They hosted book clubs, organized fun reading events, and always had a great new recommendation waiting for me when I finished a book. Plus, it would be really fun talking to kids and getting them excited about books! The most recent book I’ve read that I can’t stop thinking about is Orphan Island by Laurel Snyder. It perfectly captures everything I felt (and sometimes still feel) about growing up and not knowing what that means and having to do it anyway. It’s one of those books that asks all the right questions, but doesn’t necessarily prescribe answers. It lets readers figure those out for themselves, and I love that. It’s been a while, but I’m still thinking about how I felt when I read Orphan Island. Honestly, I want everyone to read it so we can talk about it! Laurel Snyder talks a little bit about her book on The Nerdy Book Club blog here: https://nerdybookclub.wordpress.com/2017/05/24/what-i-was-thinking-about-by-laurel-snyder/. I always have some ice cream in my fridge… even though I live next door to an ice cream shop. (Really, I do!) I don’t know what that says about me, though. Maybe that means I like to be prepared. Or maybe it just tells you that I really like ice cream. I finished reading Dog Man Unleashed by Dav Pilkey and thought it was a great graphic novel. This is the second book in the Dog Man series and it tells more about how Dog Man fights the villians. My favorite part is when Flat Petey uses the magical spray to be bad and Dog Man beats him. I love the illustrations and how creative the story is. It is also very funny; even my mom liked it. Dav is also the author of Captain Underpants, another favorite series of mine. Dav is truly talented and I can’t wait for Dog Man #3 and #4 to come out later this year! Charlie M. is a third grader who loves reading, video games, and playing sports. And he loves chewing gum. The storymamas had the opportunity to “meet” Deborah Lee Rose and Jane Veltkamp, the authors of the new non-fiction book Beauty and the Beak: How Science, Technology, and a 3D Printed Beak Rescued a Bald Eagle. They collaborated to tell the story of Beauty, a bald eagle that lost part of her beak to a gunshot wound. Her injuries healed, but her beak did not. When Janie, a raptor biologist, met Beauty, she felt compelled to help. Her compassion for the eagle was relentless, and she worked with others to help create a prosthetic beak for Beauty using a 3D printer. Janie worked with Deborah, an accomplished science writer, to share Beauty’s story with the world through an engaging narrative format and vivid photographs. Beauty and the Beak would be a wonderful narrative nonfiction text as a read aloud and an addition to your classroom library. It provides a concrete example of design thinking and perseverance. By thinking through different ideas, Janie and her team were able to come up with a solution that allowed Beauty to regain the use of a beak. We can’t wait for the world to hear Beauty’s story! How did you hear about Beauty/get hooked up together to create this story? Deborah: I had read about Beauty in several articles on animal prosthetics—the story of her pioneering prosthetic beak was reported worldwide. I wanted to know much more about Beauty herself, about Janie’s work to help her, and about bald eagles, so I called Janie at Birds of Prey Northwest, the raptor center she founded and directs in Idaho. From that first conversation grew a fantastic, ongoing collaboration to coauthor Beauty and the Beak. I ended up learning so much, thanks to Janie’s encyclopedic knowledge about bald eagles and her long experience in speaking about Beauty and other raptors to public audiences. Janie: I had wanted to work with a science writer on Beauty’s story. When Deborah called me, and I learned that she was both a national science writer and award winning children’s author, I knew together we could capture Beauty’s powerful story in a children’s book. I already had lots of photos from Beauty’s beak surgery, by amazing photographer Glen Hush; once we found the incredible bald eagle photos available from the U.S. Fish and Wildlife Service National Digital Library, we knew we could tell kids about Beauty beginning with her life in the wild, all the way up to what her life is like today at Birds of Prey Northwest. What was the process you used to create the story together? Deborah: There were so many wonderful steps to the process—including my meeting Beauty face to face in Idaho!—which happened over the course of the last three years. We spent countless hours by phone and email finding out the best way to tell Beauty’s story through both text and photos. Janie and I wanted children (and adults) to understand how critical Beauty’s beak was even from the time she was born, and how disastrous losing her beak really was. Janie: We reached out to many people for insight and help including other raptor biologists, wildlife experts, engineers, 3D printing specialists, STEM educators, and wildlife photographers. The Idaho STEM Action Center helped us with 3D printing, to make life-size replicas of Beauty’s prosthetic beak that we can share with public audiences. And even beyond Beauty’s story, we wanted to tell about the natural history of bald eagle populations in the United States—how bald eagles nearly went extinct on the U.S. mainland, how scientists worked to reintroduce bald eagles to areas where they had nearly disappeared, and what risks bald eagles still face today. We were very lucky, thanks to our publisher, to have Cornell Lab of Ornithology add special content to the book about bald eagle conservation. If you weren’t able to do your current job, what would you want to be and why? Deborah: I have been a science writer for a long time, and would always want to work in some way to communicate science to public audiences. Janie: My dream is to open a raptor education center that millions of people could visit from all over the country and the world. Janie: A book that has stayed with me since I was growing up is Aesop’s Fables. I especially love the story about the wisdom of the crow, because it’s about problem solving and the intelligence of birds. Science continues to prove how intelligent birds are across their many species. After all the years I have worked with raptors, I continue to be amazed by their intelligence. Deborah: The book that affected my whole career was Charlotte’s Web by E.B. White. I adored it as a child, because I could fully imagine myself in the story even though it was as far from my city life as you could imagine. 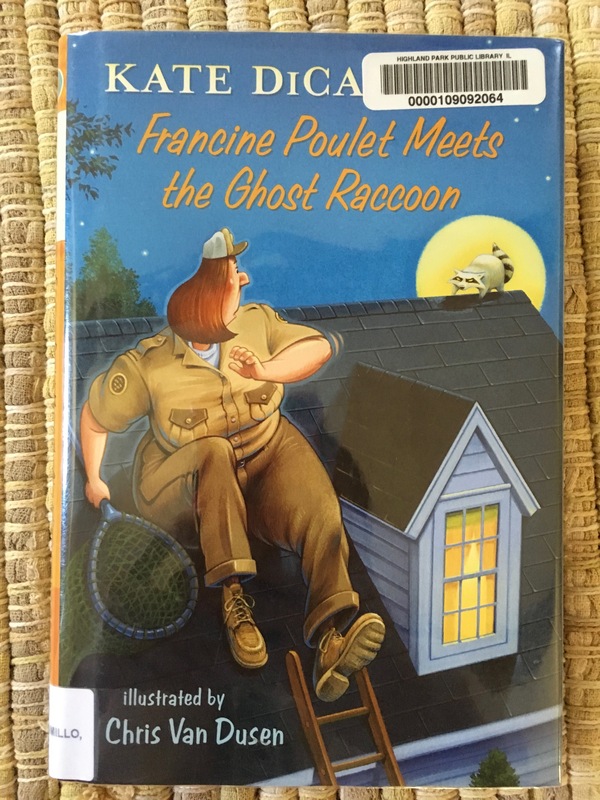 I read it again as an adult, and discovered an even deeper reason that I love it–because the character of Charlotte is truly a writer, who understands the power of words to teach, entertain, inspire and even save a life. Janie: Tiny bits of salmon—to feed orphaned baby ospreys. There is always something in my frig that will be used to feed the raptors who are in my care. Deb: Whole wheat pastry flour—I love to bake my own muffins. It took me a while to perfect my favorite recipe, and that process was a lot like creating a book! Can’t wait to read about Beauty? You’re in luck! We are giving away THREE copies of Beauty and the Beak, thanks to Deborah, Janie, and their team. Head on over to @storymamas on Instagram to enter! 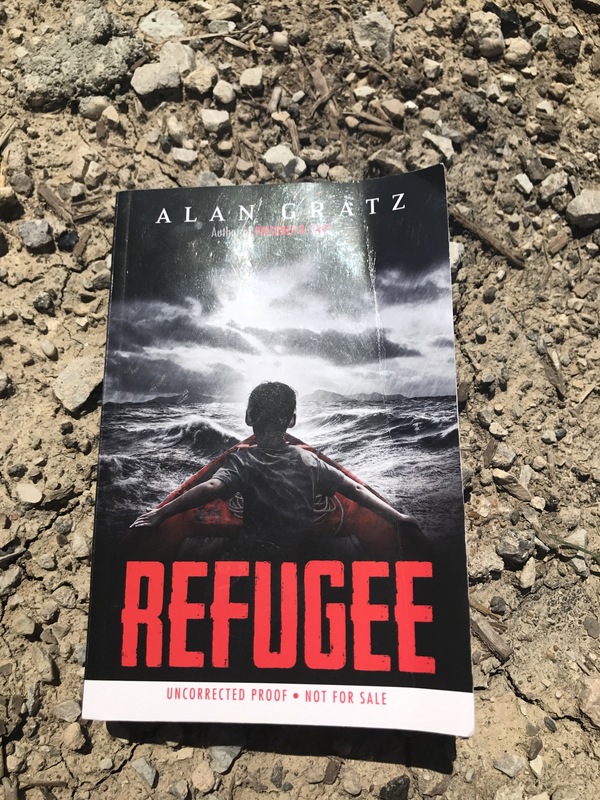 Refugee is amazing…Refugee is significant…Refugee is thought-provoking…Refugee is unbelievable but surprisingly historical fiction! Alan Gratz, author and creator of Refugee, was kind enough to step away from his very busy schedule of moving, writing his new book, getting ready for the launch of Refugee, raising his 14 year old daughter and hosting the last local pub trivia game after 7 years to hangout with Storymamas for an hour to discuss Refugee. -Who of the three characters would you be? -When you leave your house, where do you go? -If you leave your country, can you get out, will other countries let you in, where would you go? -What will you put in your backpack? -What 10 things that fit in your backpack would you take with? -When you get to the new place you’ll live, are you going to walk into the same grade level classroom or will you have to go back to 4th grade at the age of 14 because you don’t speak the language? Interestingly enough Alan wasn’t planning on writing this book, he was planning to write a story about the youngest kid who joined the navy, but when presented to the sales department he was told this book was already being written. WHAT?! Can you imagine being an author, having an idea, doing preliminary research and being told your idea is already being written?! But nonetheless, he’s a dedicated author and this didn’t deter him. He had to come up with a new idea, a new book. He thought the story of the MS. St Louis, a boat carrying Jewish refugees from Germany during WWII heading to Cuba, was an interesting one but that there wasn’t enough there for an entire book. Then during the late winter of 2015, he went on vacation with his family to the Florida Keys. One morning he went for a walk on the beach and saw sitting there in the sand, a raft. Not the raft you are probably imagining, a life raft full of air, but this raft was made of metal roofing from a shed wrapped around sideways, 2 by 4’s, a motorcycle engine and inside were sitting wet clothes, 2 liter bottles of water and candy they had used on their journey. Alan and his family were changed from that moment on thinking about how when they were sleeping in their comfy hotel, refugees came to America. While they were sitting by the pool reading books, this family was trying to survive on a makeshift raft. Alan went home, but he couldn’t stop thinking about the scene on the beach. Then walking his dog one day, back from vacation, a story, a novella as he called it, started to be born based on his knowledge of the MS St. Louis, the visions of the raft in the Keys, most likely from Cuba, and the constant, terrifying news stories about Syria. It left him feeling like he needed to do something, something needed to be written, and so once he ended his travel he outlined, researched and began to write Refugee. Alan admitted when writing, he works the hardest on creating characters, writing interesting, impactful characters. The plot, no problem, he loves writing the plot, he’s a “plot junky”, but when he needs to create characters he writes more than just an outline, he writes a character sheet for each one. He knows how imperative it is to write characters who the reader can connect with, characters who the reader understands. So with Refugee he knew he needed to create the three characters: Mahmoud, Josef and Isabel on and off the page. He needed to share their background stories, those ‘behind-the-scenes’ stories, answer the question who are they now but really, what made them that way? *Why is Mahmoud invisible? Why does he want to be invisible? Why does he embrace that? *Why does Josef want to grow up to be an adult all of the sudden? *What are Isabel’s hopes and dreams? Why is she scared of the water? What happened with her grandmother, how does that haunt her and maybe hold her back from what she needs to do? But developing these stories took a lot of work, research and thought. Because Alan was writing a book about three different characters, in three different time periods, his research was different. The research about Josef, the Jewish refugee, was done in a more traditional research method of checking out books and taking notes. But the stories about Isabel, the Cuban refugee, and Mahmoud, the Syrian refugee, he explained, were much more difficult since these two stories are more recent. While the characters are fictional, everything that happens to his characters were real accounts taken from current reporting resources like magazine and newspaper articles, so finding those stories took a lot more time and effort. One quote Alan goes back to often when talking about this book is by Eglantyne Jebb, founder of Save the Children, “Every war is a war against the child.” Children are the ones paying the price for war, whether it’s war or famine. His book is less about why they had to leave and more about what they do to survive and thus he developed characters who showed bravery even in a time of huge sacrifice and challenge. He also wanted to give each character ownership over their journey because in a time of tragedy, a time of suffering, kids are the ones who suffer the most since they are unable take action, unlike adults. Once you meet his characters and hear their stories, you will be forever changed, forever empathetic, and maybe like us you will wonder if you were in these situations what you would have done, could you have survived all they endure? 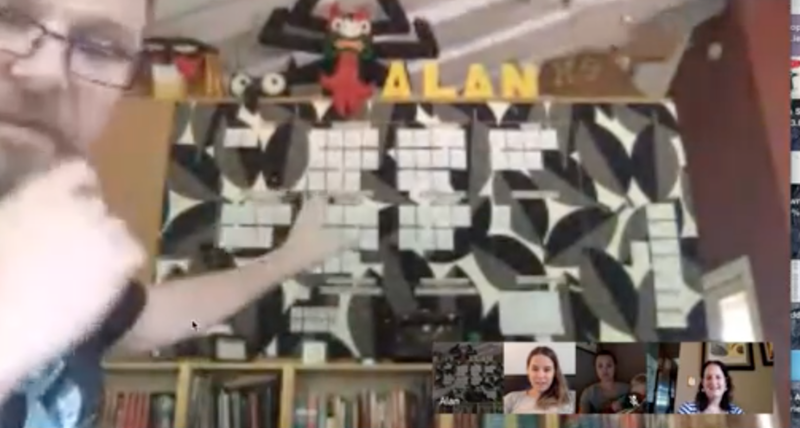 Alan, like many authors, has a system for writing and it goes something like this; a month of researching, a month of outlining, a month for his first draft and then a long process of drafting and editing, drafting and editing and finally publishing. He usually takes every three months off from traveling to do author visits and such so he can do the actual writing of his books. The way Alan outlines his books is very interesting. Here’s a sneak peak of his ‘book board’. Each notecard is a chapter in the book. We were curious about where the notecards and outlines go once he is done with the writing. He is too much of a sentimentalist to throw them away and what’s really cool is that a lot of universities collect author’s work. He gives his work to the University of Central Florida in honor of one of his beloved professors who taught him to use YA in the classroom, Tedd Hipple. So if you’re curious you can head to the university, read his book and look at his process for Refugee as well as his other books and those of other authors. A new career…Interestingly enough if Alan wasn’t an author he would be a game show host because he loves game shows. He grew up watching them and with his trivia hosting gig he probably would make an amazing game show host! An influential book….One book that has stuck with Alan through the years is Tuck Everlasting because it tackled the topic of death as being a natural part of the cycle of life. As a kid he was so afraid to die, he was preoccupied with his own death. He hadn’t read about death in this context before and so in 7th grade this book had a large impact on him. While he doesn’t reread books often, this one has been reread many times and he even read it to his daughter. The fridge….Something very interesting we learned about Alan was that he has very little in his fridge. If you looked inside every day would be the same. You would find a round glass bowl with pizza dough in it, because every night for dinner, since 8th grade, he eats a cheese pizza. According to his math he has eaten about 30,000 pizzas in his life. Sounds delicious! So if you ever invite Alan to eat with you, make sure there is pizza at the restaurant! Storymamas were changed by Refugee and we highly recommend picking up a copy today! Author AshleyPosted on July 26, 2017 August 10, 2017 Categories Author Interview, Middle Grade, Reviews and RecommendationsLeave a comment on Happy Book Birthday to…Refugee!! I’m not sure…like I said, this is a tough one! I love that show! My all-time favorite contestant has to be Fik-shun because of how surprisingly versatile he was. My favorite performance, though, is “Fix You” with Robert and Allison. That routine is so gorgeous and heart-wrenching. I’m tearing up just thinking about it. Although you’ve said Dillon was similar to you, which character was the most fun to create? Definitely Sarah! I really enjoyed taking the stereotypical “mean girl” and figuring out her backstory. She has so many secrets and reasons for acting the way she does and I can’t help but root for her. I would love to be an explorer because traveling is something I can’t get enough of. And if I couldn’t do that then perhaps I’d be a librarian. Who’s also a ninja crime-fighting superhero. With an adorable doggy sidekick. Hands down, Bridge to Terabithia. That book is the one I read when I need reminding how to craft complex characters and beautiful descriptive language. We just had friends over so my fridge is pretty empty. However, it’s rare to look in my freezer and not find a pizza in there. Pizza’s my go-to comfort food and my life wouldn’t be complete without it. Lou Lou and Pea are such good friends, was their relationship modeled after one of yours? Which character are you most like? Lou Lou and Pea’s friendship isn’t modeled after one particular relationship in my life, but it is a mash-up of many. I have been fortunate to have many wonderful and supportive friends, both as a child and an adult. These friendships are some of my most valuable relationships so it seemed natural for them to inspire the book! 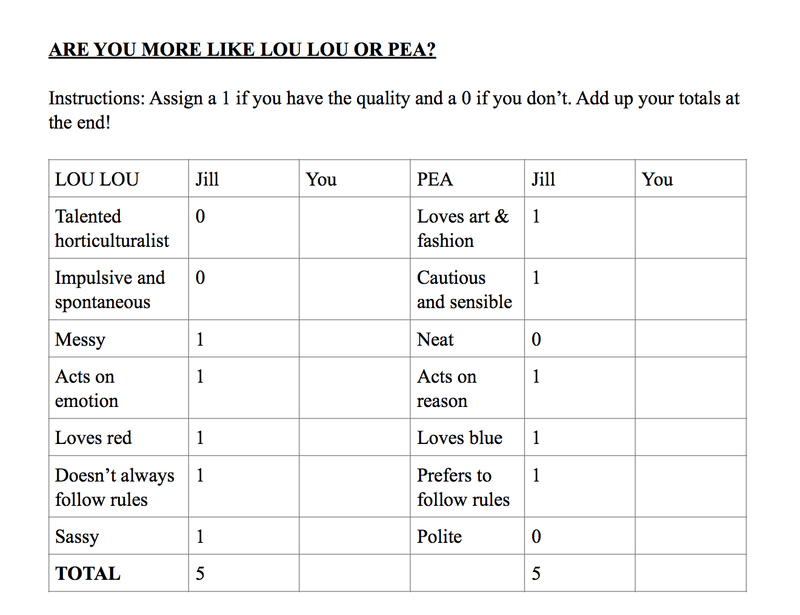 I’m similar in many ways to both Lou Lou and Pea. I actually made a little character chart* to determine which friend readers are most like and I ended up with a tie. Did you have the ending in mind when you wrote the book? Was there consideration to not have the mystery and have a book that taught us about the culture and traditions in the town? I didn’t know the ending until I was very close to finishing my initial draft. I always intended this particular book to be a mystery. However, the second Lou Lou and Pea book, LOU LOU AND PEA AND THE BICENTENNIAL BONANZA is not a mystery (though it has mysterious elements) and focuses a lot on the culture and traditions of El Corazón. I’d want to be a professional figure skater because they have such beautiful, sparkly costumes and they’re so talented, graceful, and strong! Unfortunately, I’m incredibly uncoordinated and I don’t do well in the cold. I have a special place in my heart for the Ramona Quimby books. I recently found my copies of The Ramona Quimby Diary (yes, I have two copies) from first and second grades and reading through them was hilarious. Sriracha. I’m a little bit fiery, but I can be a good complement for others, and I like to wear red. If my children learn anything from me, it’s that they learn to be nice, good human beings. Sure, I work on letters, colors, shapes, but more importantly, I work on manners, showing kindness, and thinking of others. This I find to be the harder of the two. At four years old, my daughter, A, has plenty of time to learn the academics, and what she does know has come through books, play, and conversations. But it’s the social pieces, the pieces that I feel are way more important, take longer and are harder to develop. It might also be directly correlated with the amount of gray hairs popping up on my head. B, who bravely goes up to my daughter and asks her to play. Perfect, I think. But was does my darling daughter do? Tells her no, she doesn’t want to play with her. What? After all of our conversations about being a kind friend, she tells this kid no? Trying to avoid being a controlling mom, I call A over to simply have a conversation with her. When I asked her why she didn’t want to play with the little girl, she told me it was because she was playing with X. X, as in the kid that is swimming away from you and doesn’t really seem to want to play? Yes, she replied. After some coaching, she ended up playing with B, and had a blast. But it was the in-the-moment guidance, me being very blunt in telling her that X is swimming away and doesn’t seem to want to play with her and that she has an opportunity to make a new friend and play with someone that seems interested in her, that helped her navigate through the situation. And I won’t always be there to help, and she isn’t always going to want to hear her mother’s “lecture”. But if we don’t teach and model positive social behavior at an early age, they grow up not knowing. And I have a feeling these are the kids that I come across, the ones that have “encouraged” me to teach kindness. 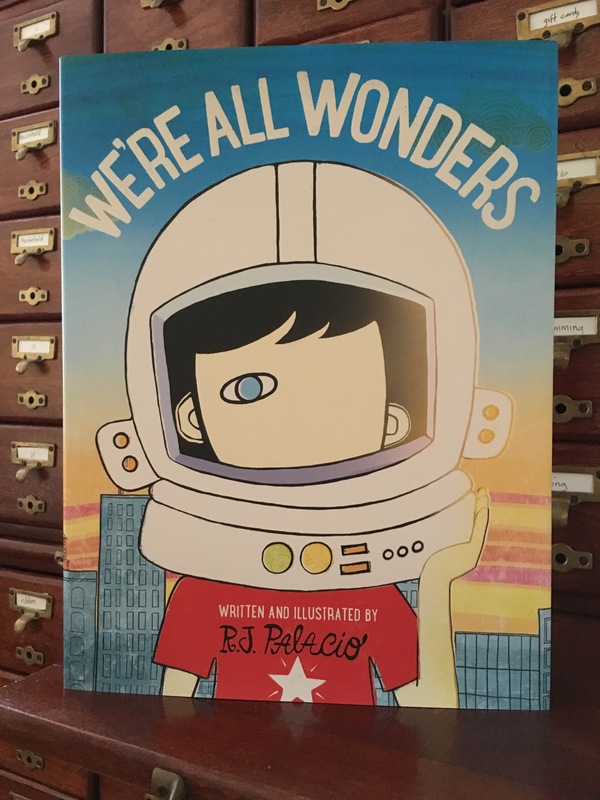 a glow around it and you want to shout, “This, this is what life is about.” So when my copy of We’re All Wonders arrived in the mail, and the light seemed to glow from inside of the box, I knew this one wouldn’t let me down. I’ve already read it to my daughter, and while she heard the message, I don’t think one time through will magically make her a kind and compassionate kid. It takes time. And it takes books like this as a starting point. We have to teach our kids to be kind, to be accepting of others. Because if we don’t, who will? How will they learn that it’s ok to be different, that if we were all the same, life would be boring? They have to learn it from us. From our conversations, and more importantly, from our actions. When I pick my daughter up from preschool each day, I always ask her, “What is one thing you did today to show kindness to someone else?” Maybe it’s time we all start asking ourselves that. Are there any favorite books you have that model kindness? Painting rocks to spread kindness, helping her brother, baking Christmas cookies for the fire and police departments. 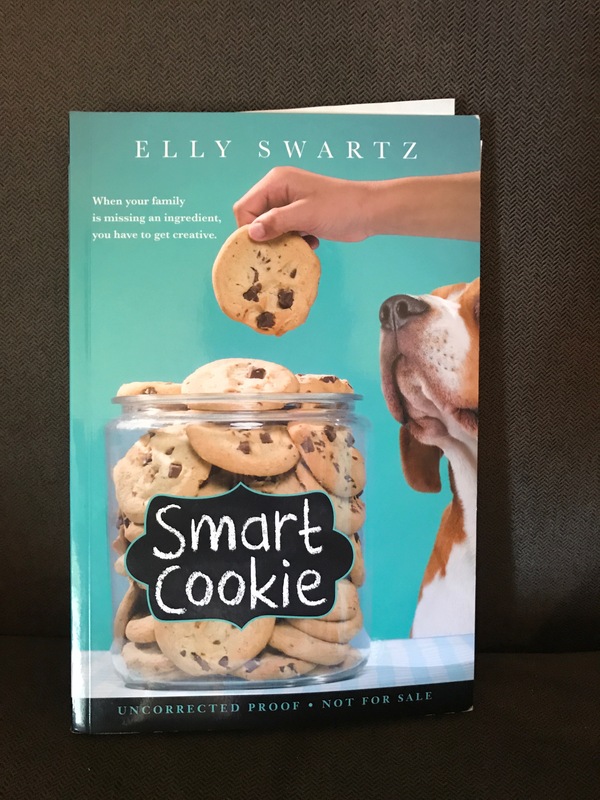 We had the Opportunity to meet with Elly Swartz, creator and author of the book Finding Perfect, and the not yet released Smart Cookie, coming out January 2018. All three storymamas agree Finding Perfect is a book that will stick with us forever. Elly chatted about her book, her journey as an author and what you might expect to find in her refrigerator. Finding Perfect is a story about Molly who has Obsessive-Compulsive Disorder (OCD). It is a story about her difficult and emotional journey trying to navigate through middle school with this disease no one knows she has, including herself. 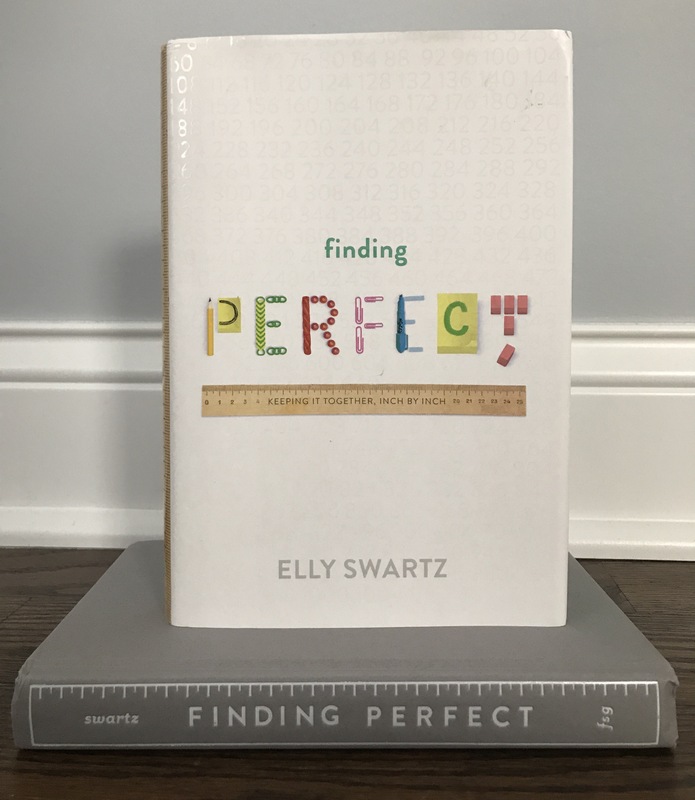 One of the many reasons we fell in love with Finding Perfect was because it’s a book filled with emotion through Elly’s words and her development of characters. Elly describes her book using three words: heartfelt, authentic and informative. As non-writers we can only imagine how difficult it must be to write a book with such feeling and emotion, but Elly explained that it wasn’t really an easy or hard book to write, just that it was emotional. Many times she would be writing through tears because the emotions her characters were experiencing were her own. While she doesn’t have OCD, she has friends and friend’s children who do have OCD, and she explained in order to create authentic characters it is important to allow the emotions in your own life to guide your writing. While writing this book she would go back to the places in her own life where her heart was hurting. She went to the difficult or dark places in order to create authenticity. Elly’s hope after writing this book was for it to become universally relatable, and in our opinion, it completely is. As readers, teachers, and mothers, we were able to connect and feel for Molly throughout the book. This is one of those books that makes you gain a better understanding of not only someone struggling with OCD, but also feel empathy for those struggling with any type of anxiety or stress, which is a part of everyone’s life. Children and adults are constantly looking for how to connect with others and when there is a disconnect it can be very scary. Elly explained that there are moments when we all think, ‘What’s going on with me? I’m so scared to find out, scared to actually know and scared to tell anyone there is something going on.’ We all have to overcome hard and difficult things that can feel scary and Elly wants to make sure kids know they aren’t alone in that journey. She wants kids to know nobody’s perfect and no one’s life is untainted by difficult moments. But when she’s really in it, there are times she doesn’t get out of her pajamas, has her coffee, and the next thing she knows she has missed lunch because she’s in the zone. However, just like other writers, Elly can sometimes get stuck. When she does, her trick is to go somewhere she usually doesn’t associate with her writing, like a coffee shop or to head to the doctor’s office an hour early. This way she says no one sees her and no one sees what she’s doing and there is no pressure. After talking with Elly for over an hour we learned she is a very dedicated and persistent person, in all the best ways possible. Fifteen years ago her writing journey began, she had read Mick Harte was Here by Barbara Park with her then 4th grade son, and while reading, she felt so many emotions; she was so moved that she decided she wanted to be a storyteller. She started writing, writing, writing. Young writers would be very surprised to know that her journey to getting Finding Perfect published was a long and hard one. Finding Perfect wasn’t her first book, it was actually the 5th book she wrote and it took 8 years to write. Talk about persistence! Even after getting the book sold she spent four years working with a pediatric specialist to make sure her story was authentic and relatable. She wanted to get it right and it was imperative to do so out of respect for the OCD community. Interestingly though Elly has had many other jobs as well as being a writer. She’s a lawyer and for twenty years she wrote and edited law books with her father-in-law and her husband. Six years ago she started a business to help families navigate the college entrance process. She has a love for helping kids in such a pivotal time in their lives. But she’s been writing all along. One would think with the very long, and what sounds like a difficult, journey to publish her first book, she would give up, but no. Like we said, she’s extremely persistent. She has a very strong support system and that helped when she wasn’t getting published. Even with the rejection she said, “I love writing more than I hate rejection.” She would give herself 48 hours to be mad or sad but every time she’d end up back in her chair writing. Elly compares writing to the switchback trails in hiking saying, “you see a lot of gems along the way that you wouldn’t have seen if you went straight down”. During the fifteen year journey of writing this book she was fortunate enough to be a part of a writing community where she learned a lot about herself and met some of her closest friends who helped her writing along the way. When we speak to our students during their own writing, some advice Elly gives is to use your senses in your writing because it helps create authenticity. How does something taste, feel, smell, etc. But they don’t have to be huge moments, they can be “the little slivers in life.” Use what you have; the emotions you’ve experienced to write. Even as simple as the best pizza ever! Twizzlers (not in the fridge but around the house all over) because she love them and so does Molly, and she can eat them because of her allergies. Storymamas highly recommends Finding Perfect and we hope you will pick up a copy because it is truly amazing. It will make you feel so many emotions while reading. It will make you want to hug Molly, the main character. It will make you want to read her next book too Smart Cookie. Check out Elly’s website http://ellyswartz.com/ to learn even more about her. Growing up, I do not remember there being a lot of options for chapter books when I first started reading. I remember reading Frog and Toad, and Amelia Bedelia before I got into “real” chapter books that didn’t have any pictures. As I am now reading similar books to my four year old daughter, I have learned just how much has changed. There are so many wonderful options available, but I’ve narrowed down some of our favorites that would be just right for someone beginning to read chapter books, or like in our case, a good book for an adult to read at bedtime. The chapters are shorter, the font is bigger, and there are pictures to help tell the story. Last week I talked about the Dory Fantasmagory series on Instagram for #storymamasbookaday, and here are some others in addition. Happy reading! 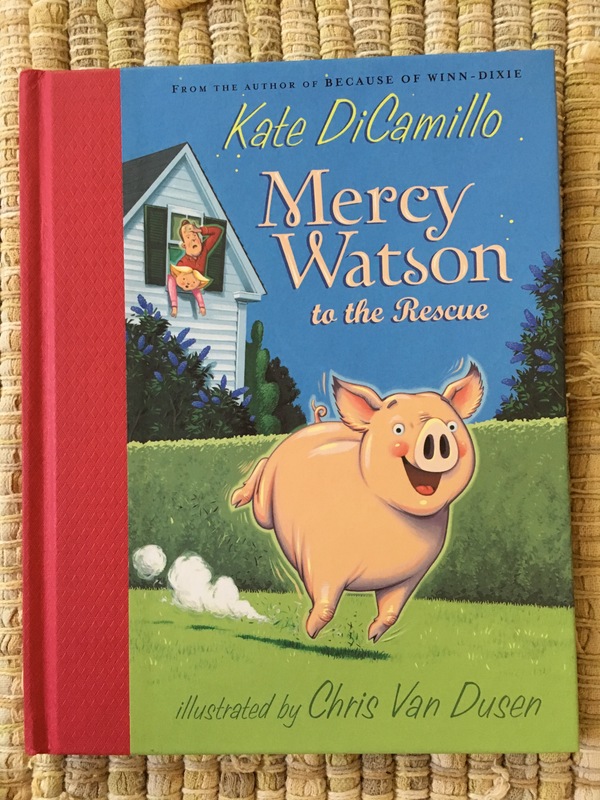 This series tells the adventures of a pig named Mercy Watson, and her human owners/parents, Mr. and Mrs. Watson. Mercy has a love of buttered toast and seems to get herself into a funny pickle in every book. There are six total books in the series, and they have colorful illustrations on almost every page. This is a spinoff series of Mercy Watson. It tells the stories of the other people that the reader was introduced to in the original series, such as Leroy Ninker and Baby Lincoln. Not to worry, the beloved Mercy Watson makes appearances in all of the books. There are currently three books published in the series, with the fourth coming out in October. This is a spin-off series from one of Cronin’s other series, The Trouble with Chickens. There are four chicks that make up the Chicken Squad, and despite being adorable and small, they are brave crime fighters, solving mysteries. These little chicks will keep you laughing throughout. The fifth book in this series comes out in November. 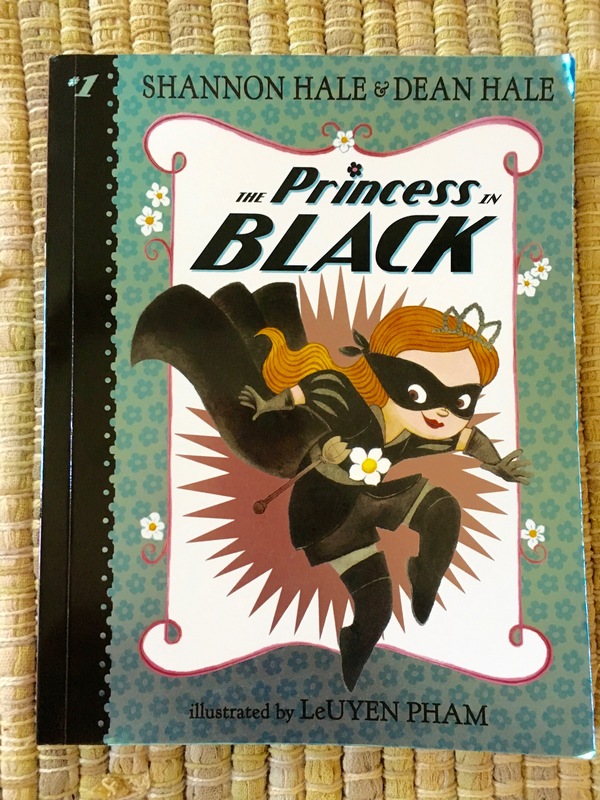 This series tells the story of frilly and pink Princess Magnolia, who leads a double life as the Princess in Black. Her alter ego uses trap doors, wears a black ensemble to keep her in disguise, and bravely fights monsters. The character is a good, strong female role model for girls, and the illustrations truly make the story come to life. There are currently four books in the series, with the fifth coming out in early September. Are there any early series that are favorites in your house? Stay tuned for more recommendations!